Radiochemistry facilities in both academic medical centers and commercial nuclear pharmacies consist of technologically advanced laboratories paired with sophisticated imaging and data analysis suites. These units are staffed by multidisciplinary teams of basic scientists, clinicians, technologists, staff scientists, and students and are equipped with state-of-the-art instruments for the daily production of radiopharmaceuticals as well as the performance of preclinical and clinical nuclear imaging and targeted radiotherapy experiments. 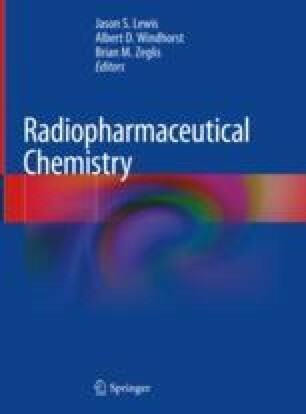 In this chapter, we will use the lens of positron emission tomography (PET) to provide an overview of the major instrumentation and equipment needed to take a radiopharmaceutical from bench-to-bedside in a manner that is compliant with all pertinent regulations. We also turn our eyes to the future, imagining what the PET Center of tomorrow will look like once all the equipment is connected through the Internet of Things (IoT). Financial support of this work from the US DOE (DE-SC0012484) is gratefully acknowledged. The authors declare no competing financial interest. Ashton K. That ‘Internet of Things’ thing, 22 Jun 2009. RFID J. http://www.rfidjournal.com/articles/view?4986. Accessed 5 Nov 2017. Ungoed-Thomas J, Henry R, Gadher D. Cyber-attack guides promoted on YouTube. The Sunday Times [Online], 14 May 2017. https://www.thetimes.co.uk/article/cyber-attack-guides-promoted-on-youtube-972s0hh2c. Accessed 5 Nov 2017. U.S. Food and Drug Administration. Vulnerabilities of HospiraLifeCare PCA3 and PCA5 infusion pump systems: FDA safety communication, 13 May 2015. http://wayback.archive-it.org/7993/20170722144742/, https://www.fda.gov/MedicalDevices/Safety/AlertsandNotices/ucm446809.htm. Accessed 5 Nov 2017. Prodhan G. Siemens to update medical scanner software to deal with security bugs. Reuters [Online], 7 Aug 2017. https://www.reuters.com/article/siemens-healthcare-cyber-idUSL1N1KT0WZ. Accessed 14 Jun 2018.